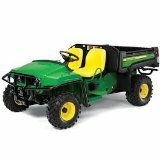 John Deere 4X2 / 6X4 GATOR technical service Repair manual on CD John Deere CD service/repair manual for your original Gator 4X2 and 6X4 utility vehicle in both gas and diesel. The original Gator was made from 1993 thru 2005. This is a valuable 692 page dealer service/repair manual TM1518 that details diagnostics of system functions, testing procedures, major component, removal, disassembly, inspection and reassembly instructions, theory of operations, specifications, capacities of the electrical, engine, transmission, hydraulic, steering, braking, chassis and more. All the information necessary to repair and maintain your John Deere Gator. This manual is in PDF format and indexed. Go to the index on the left side of the page, click on the section you want and it will go to that section. Print the exact page you want. At $59.95 this is the best price on the internet.